WHAT: Create photo books by gathering photos from friends and family in one shared album. Group members can rate and pick the best pictures, and Reunik can guide users by showing them which ones their group liked most. Professional photo artists then retouch the photos and lay out the photo book. The customer signs off on the design and receives the book by mail. LAUNCHER: CEO Yann Bienvenu has worked for several companies and startups in the telecom sector in France and abroad. He also studied photo sharing in social networks as part of his master's in business administration and sociology. WHY: Retailers and online printing services make it possible for anyone to make photo books from digital pictures, but creating those books is still complicated, time consuming and solitary. Photos of one subject or event are typically spread across social networks, smart phones, laptops, etc. Photo-sharing sites and social networks are not designed for building a physical book with a group. WHEN/WHERE: Beta (in France) since July 2011. Public launch planned for January 2012 (France only). BACKSTORY: Yann got the idea for Reunik when he tried to create a photo book of his baby daughter. “It was very complicated and time consuming as I had to get all her relevant pictures from family and friends, choose the best ones and afterwards create the photo book by selecting a template and arranging the pictures," he says. ON THE NAME: Reunik is a word play on re-unite and unique. BUSINESS MODEL: Freemium -- free to share and choose photos, pay for the photo books. Prices range from 7.90 euros ($11) for a small pocket book to 59.90 euros ($85) for the “Prestige XL” book with 26 pages. The price includes retouching and layout, shipping is separate. COMPETITION: 1) Online printing services such as Photobox or Blurb as well as retail services like Walmart (though retailers in France do not offer photo books). 2) Photo platforms like iPhoto, Flickr and Picasa. 3) Smart phone and Facebook apps like Color, Liveshare or Pixable. ON REUNIK'S COMPETITIVE ADVANTAGE: Yann says, “None of our competitors combines the work of human artists and smart use of technology, data and image recognition." CUSTOMERS/GROWTH: More than 1,000 beta users since launch earlier this month. Already generating revenue through photo book sales. PHILOSOPHY: “Reunik brings your important moments back to life," says Yann. ON THE INDUSTRY: According to Yann, the industry is missing the opportunity of group-created photo books. Photography has always been social, and photos make the most impact when shared. WHO BACKED IT: Bootstrapped. Yann is planning to raise between 300K and 1M euros ($430K and $1.4M) later this year. NUMBER OF EMPLOYEES: 1 (Yann plus six interns). 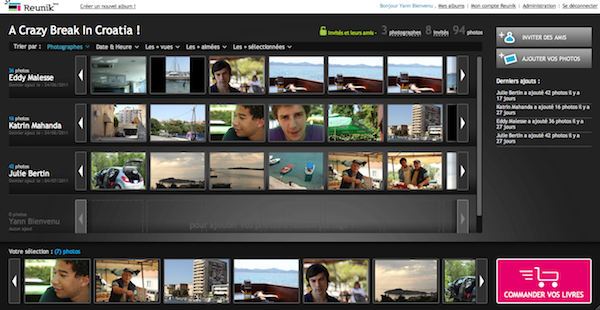 After naming the photo album, upload photos from your computer, social networks and mobile phone. Invite friends and family to share more pictures or view the album. All invited users can see the photo album, sort and review photos, select favorites, etc. Finally, select the type of photo book. Within 48 hours Reunik sends you the book design. The book will not be printed until you sign off.